Leading air traffic services provider NATS recently (19 September) presented a donation to the Rainbow Centre in Fareham on behalf of Mark Hoban, the MP for Fareham. NATS CEO, Richard Deakin and Mr Hoban visited the Centre to present the donation to Lara Bull, the Centre’s Director. The Rainbow Centre was selected by Mr Hoban for the donation following a competition in the Houses of Parliament to test if MPs had the necessary skills required to become air traffic controllers. 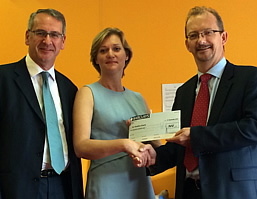 Richard Deakin said: “I am delighted to present this donation, on behalf of NATS, to the Rainbow Centre today. I am grateful to Mark for introducing us to the Centre and it was a pleasure to visit and to see the great work they do. I would like to thank Lara for facilitating the visit and I hope that this donation can help further deliver the vital services that are provided by the Centre’s team every day. Mark Hoban MP said: “NATS and the Rainbow Centre are great examples of the excellent work that happens in Fareham. Both are leaders in their field and I am very proud of my links to them. The Rainbow Centre is leading the way in transforming the lives of children and adults affected by cerebral palsy, strokes, MS and Parkinson’s. NATS has a global reputation for air traffic services and is a great British success story.